Then I realized that the handy little microwavable package of frozen corn I’d bought was in fact not regular corn, but was coated in a LOT of butter sauce. The butter sauce proceeded to explode out of the plastic bag in the microwave, so not only did I have to clean it out of there, I also had to try to rinse/wipe it off every piece of frozen corn because I didn’t want it to ruin my dish. Once that was out of the way, I proceeded to dump way too much oil in my pan for cooking the onion, then forgot about the onions so they almost burnt, then sliced all the way through one of my peppers when I was stuffing it so I had to cut it in half …. You get the picture. After all that, I was praying that this dish wouldn’t also turn out to be a disaster, but it blew away all my expectations and turned out so good! 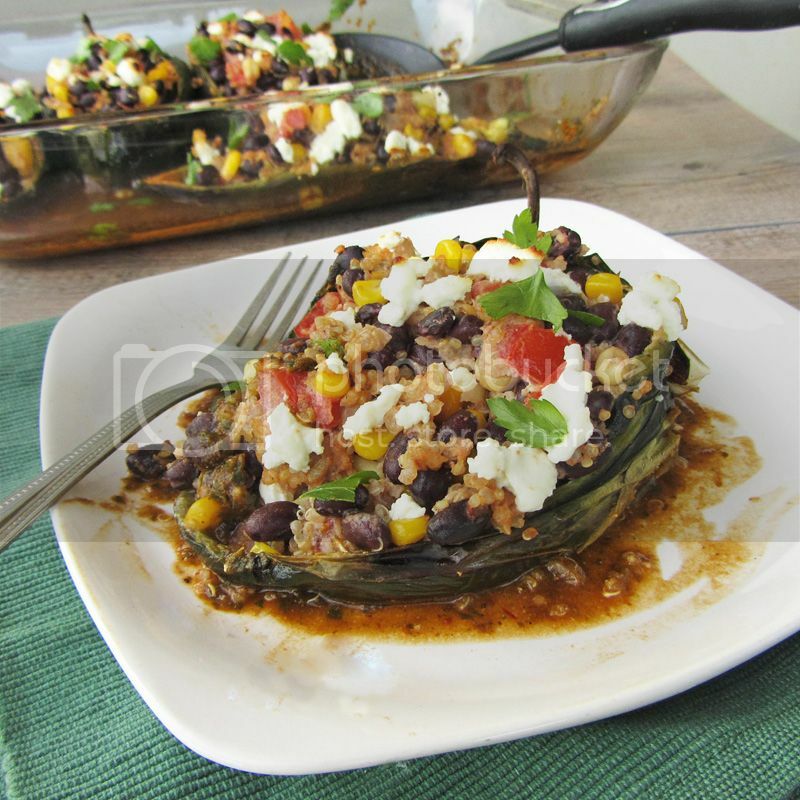 I’ve made stuffed green peppers before, but these were so much better. The poblanos are roasted before stuffing so they’re nice and soft. They also have a really nice flavor that’s very mild for a hot pepper, so they don’t give off much heat. And they make the perfect vessel for stuffing, especially with a delicious quinoa, vegetable, and goat cheese mixture! All in all, this was a fantastic vegetarian meal that was both healthy and filling, and definitely worth my little series of kitchen disasters! Preheat oven to 475°F. 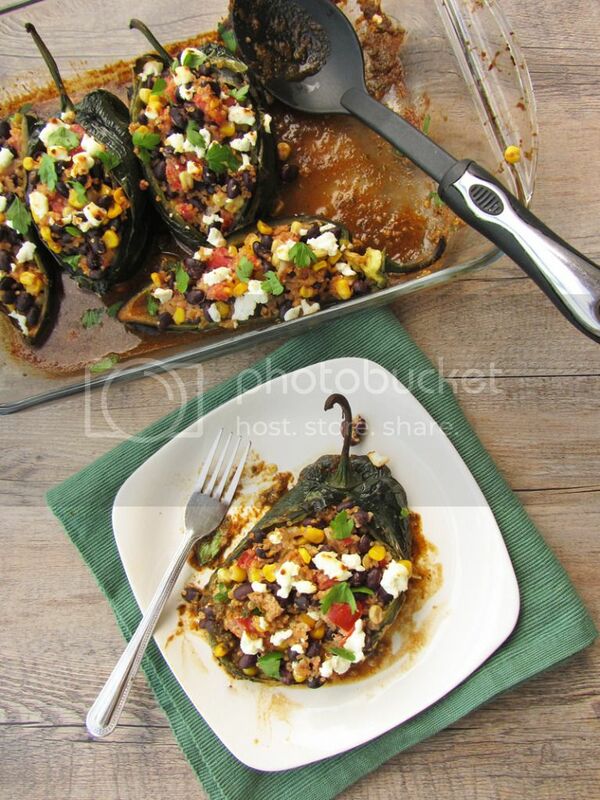 Rub poblano peppers with two teaspoons of vegetable oil and place on a parchment paper-lined baking sheet. Roast in the preheated oven until soft and slightly blackened in spots, about 15-20 minutes, flipping once. Let cool. Meanwhile, bring 1/3 cup water and 1/3 cup vegetable stock to a boil in a medium saucepan (I like to use part vegetable stock for quinoa to infuse extra flavour, but it’s not necessary if you don’t have any open vegetable stock, you can use 2/3 cup water instead). Add quinoa, cover, and reduce heat to medium-low to simmer. Cook until tender, about 15 minutes. Remove from heat and let stand 5 minutes, then remove lid and fluff with a fork. While peppers and quinoa are cooking, prepare the chipotle sauce in a blender. Combine chipotle chile, garlic, 3/4 cup water, and a dash each of salt and pepper in the blender and blend until smooth. Add 1/2 cup cilantro and pulse a few times to combine. Set aside. In a large saucepan or deep skillet, heat 1 tablespoon oil over medium-high heat. Add onion and sauté until soft, about 5 minutes. Add corn, black beans, tomato, and cooked quinoa and stir until heated through, about 2 minutes. Add 2 ounces goat cheese and stir until it's melted and completely mixed in. Season with salt and pepper to taste. Make a small slit down the length of one side of each pepper, being careful not to cut through to the other side. Carefully remove seeds, leaving stem end intact. Spoon quinoa mixture into each pepper to fill them. Pour chipotle sauce into a 9x13-inch baking dish. Transfer stuffed peppers to the dish, and dot with remaining 2 ounces goat cheese. Bake until cheese is golden, 15 to 20 minutes. 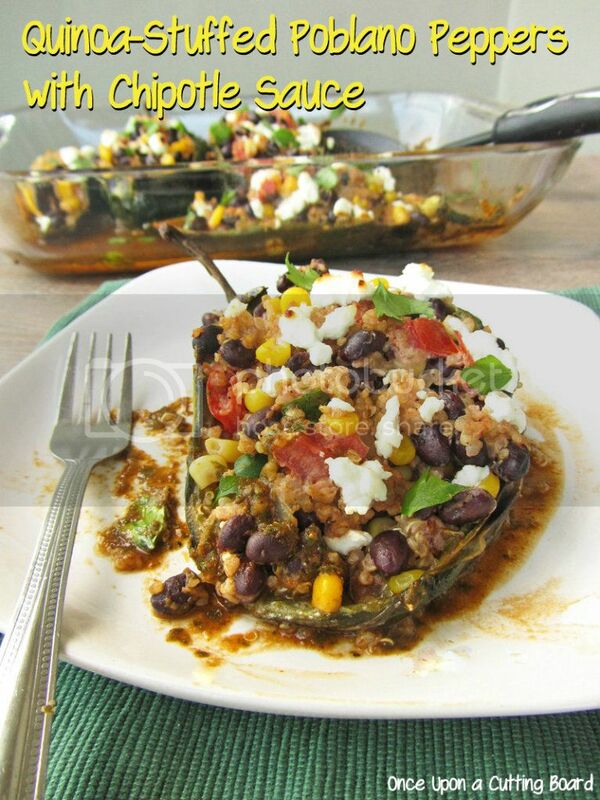 Cool in pan 10 minutes and serve warm, sprinkled with additional chopped cilantro if desired. I totally have disaster days like that...but it's always so awesome when they end up turning out deliciously! I want these in my kitchen...like, right now. That chipotle sauce? Swoon. I found them kind of hard to find, which is why it took me so long to try one .. I eventually found them at the farmer's market but they don't even seem to sell them in grocery stores around where I live! Great minds think alike! :) Can't wait to see your version! I made this last night and it was delicious. However, I confused it with another recipe I was thinking about making that said to cut the peppers in half first, so they ended up more as topped peppers. This didn't stop it from tasting great. I used Daiya instead of the goat cheese and it really was good. Thanks, Courtney! I accidentally cut all the way through one pepper too but it still worked okay stuffing the two halves, they were just a little smaller! This was really delicious...my husband declared it a keeper! Thanks Holly, I'm so glad to hear you enjoyed it! Okay, you just made my day - no, my week - by posting that! Thanks so much for taking the time to leave a comment, I really appreciate it, and I'm so happy to hear that you liked this as much as I did!